If you put off purchasing the critically acclaimed Lara Croft and the Guardian of Light on Xbox Live Arcade last year because of the 1200 Microsoft Point price tag, then now's your chance, since for this week only it's available for a measly 600. That's like, half price! Lara is on fine form in this instalment from Crystal Dynamics, a team who, in their wisdom, decided Lara must be a little lonely in her preferred field of exploration and teamed her up with an extra companion. As such Guardian of Light differs from other Tomb Raider offerings in more ways than just neglecting the Tomb Raider prefix. Despite remaining at it's core an action-adventure game, Guardian of Light adds a new dynamic to the series through the medium of co-operative play. The co-op aspect is a welcomed addition to the franchise and it really is quite fun to romp through the environment with another player. My flat mate and I sat down and played through the co-op and found it incredibly rewarding to work out the puzzles together, fight enemies together, and even quite enjoyable beating each other in gathering collectables scattered throughout the world. It felt very reminiscent of days gone by spent in the arcade with friends, jointly battling through levels of games such as Streets of Rage or Golden Axe. There's even scores that pop up on screen as you beat enemies or collect items, allowing for mini rivalries between you and your partner as you play. Unfortunately though, unlike the arcade games mentioned above there isn't an option to simply drop in and out of second player, meaning player one needs to quit out to the main menu and re-start in co-op before player two can join. It is a missed opportunity I feel since both Lara and the titular Guardian of Light himself, Totec has different skills that can be utilised and combined in order to solve the world's puzzles and challenges. For example Totec is able to raise his shield in order to protect both himself and Lara from barrages of arrows, allowing for players to get close to the source of the trap and destroy it. Lara on the other hand can use her grappling hook in a variety of ways: either making rope paths for Totec to traverse or throwing Totec one end of the rope when he's on a ledge so that she can climb up and meet him. As I said, working out which skills we needed to utilise together felt incredibly rewarding and enjoyable. So, even though there is a single player option, if you are considering getting this I'd encourage you to play it with friends, whether it be locally or over Xbox Live. Further to the puzzles there are also plenty of monsters to battle your way through and lots of upgrades available throughout the world for you to collect, including: weapons, ammo upgrades, health upgrades and buff and debuff items that each player can assign independantly - allowing you to both specialise in different skills to one another. 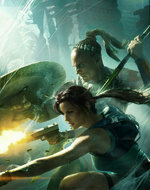 The fighting style of the game is also quite different from Tomb Raider's of the past, whereby you simply depress the right trigger to arm your weapon and use the right analogue stick to push in the direction you wish to fire. It's a mechanic that's quite similar to Geometry Wars or Shadow Complex, but works very well in this context. Aiming can be a little off at times but generally you snap to enemies with ease. To conclude, Lara Croft and the Guardian of Light is a very fun addition to the Tomb Raider franchise. The game looks stunning but it's the gameplay mechanics here that really make it something special and above all fun to play. I'm not the biggest Tomb Raider fan generally; something just never clicked with me and the series. But with this game I had an absolute blast. It scored incredibly well on release and I can see why. There's tons to do: different difficulty settings, collectables and challenges for example, which are sure to keep you busy for hours. At 600 Microsoft Points it's an absolute bargain.